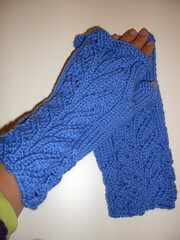 I finished these mitts this afternoon. It was a satisfying quick project. Knitting on the thumbs were the biggest pain, but they didn't take too long. I used one skein of Cascade 220 Superwash.